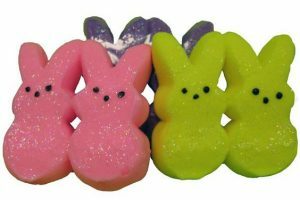 Peeps are very polarizing food. It seems like you either love the little marshmallow chickens or you don’t. Wherever you fall on the Peep scale these weird little treats have a cult following. 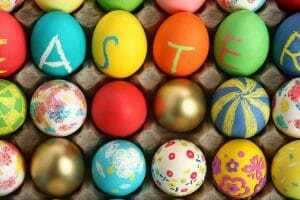 Peeps were first introduced to the candy world in 1953 by Sam Born, a Russian immigrant and today over 700 million Peeps are consumed in the United States making them the 5th most popular Easter food. Today Peeps come in many flavors including Pancake Syrup, Birthday Cake, Root beer Float and Blue Raspberry amongst others. Each Peep has 28 calories and lasts 6-8 months beyond their expiration date but I can recall finding Peeps in my Easter basket a year later and still eating them. 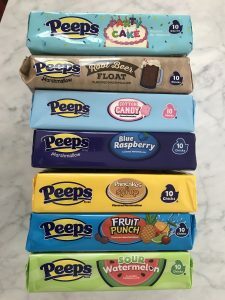 Peeps can be multi-purpose and used in recipes like Peep Rice Crispy Bars where you cut up and add the little treats at the end of the string time or as a garnish in the Peep Lemon Drop. 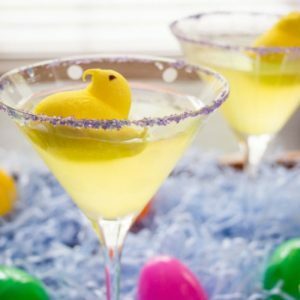 After all who doesn’t want a peep floating in their martini glass. Peeps made a comeback in recent years on the camping scene where I have it on good authority, they make an excellent s’more marshmallow. I am going to taste test 7 Peep Flavors and give you my results with my friends Jason Matheson from the Jason Show and Stephanie March from my Weekly Dish Radio Show. Stay tuned for or the results.